One of my favorite parts of doing the article on how to create patinas on metal for the Summer 2016 issue of Stringing magazine (other than seeing my name in real paper print again–woohoo! It has been awhile!) was watching the gorgeous blue-green color form on the metal due to exposure to ammonia. But it didn’t all go so well. For example . . . I created all of my samples while I was on vacation at the beach, and I forgot to take sawdust or shredded paper, etc., with me for the immersion process. So as I was sitting on our deck by the ocean thinking of how I could improvise and what I had that was moist that I could submerge the samples in to create patinas . . . naturally, I thought of sand. So I grabbed my flashlight and trekked out to the beach to get some. Well, that wasn’t the best idea I’ve ever had. 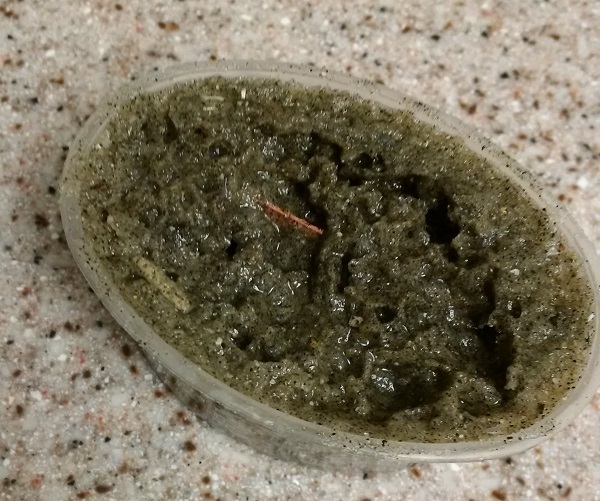 I’m not sure if there are microscopic living things in sand, or perhaps it was bacteria dying–eww–but when I added the bleach and salt, the whole thing bubbled and foamed up. It kept bubbling for awhile, too, and it looked more like a witches’ brew than anything you’d use to create patinas for metalsmithing. In the morning, I realized that the sand was not going to dry up enough anytime soon to let a patina start to form. It was too heavy and too much “in contact” with the metal surface. So I started over with direct application using cotton balls and let the samples sit on a paper towel to create patinas. See the texture on the paper towel? That’s why the finished sample in the magazine has a checkerboard look, almost like fabric. That’s how the pattern of my paper towels ‎transferred onto the backs of my metal samples, which is kind of fun and interesting. We have some paper napkins with an embossed rose pattern on them; the next time I want to create patinas on metal, I’m going to try to re-create that process and see if I can get the rose image to appear on my metal. The egg fuming process to create patinas was super easy to do, but it comes with a huge measure of caution. Using an egg to patina sterling silver works best if the egg is hot, and once it cools, you can warm the egg and repeat the process to achieve more color on your metal. However . . . warming the egg in a microwave is an art. At merely 7 seconds in the microwave, this happened. 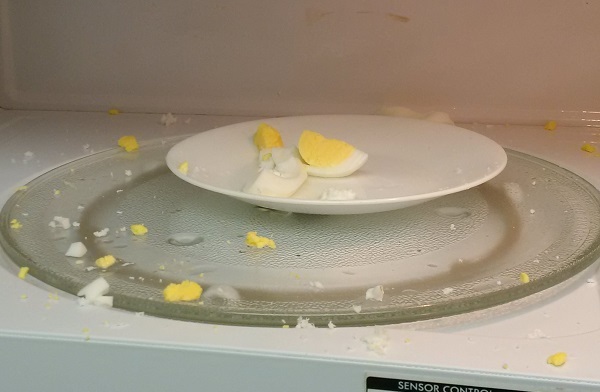 Be sure to cut the egg before you zap it, and go 2 to 3 seconds at a time, stopping in between and checking for heat. 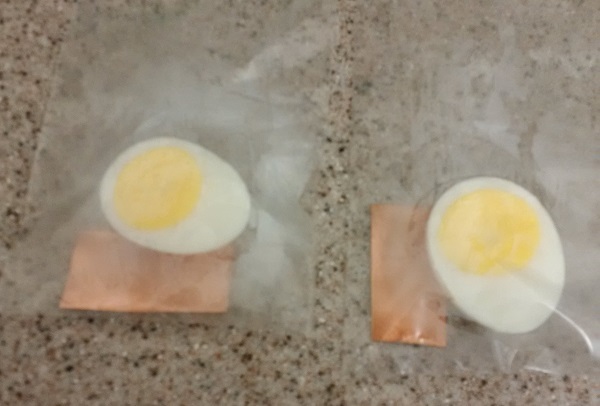 Better yet, hindsight tells me I should have left the egg in the plastic baggie, removed the metal, and zapped the egg in the bag. You’re welcome. Note: This shows my attempt to create patinas on copper and brass with an egg. 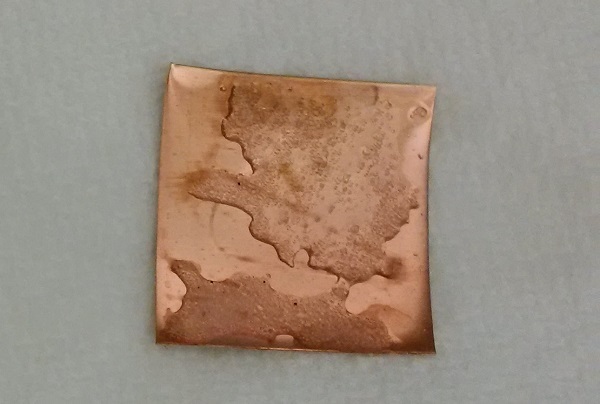 You might recall from the article in Stringing that this was an experiment that didn’t work–it created very little color on the copper or brass. This technique is meant for silver, and it did create nice color on the silver. Don’t be afraid to experiment when you create patinas! Some of my best work has come from it. I’ve heard that you can create patinas on metal with MiracleGro, so that and rose-embossed napkins are next on my list!